Juju has some similar origins as does Voodoo. Both are west African in origin and both have similar linguistic roots, but the two are not related. In modern language Juju has also come to mean Magic or magical like properties. Similar to the way Hex has been used. Though today one can talk about "Bad" and "Good" Juju. 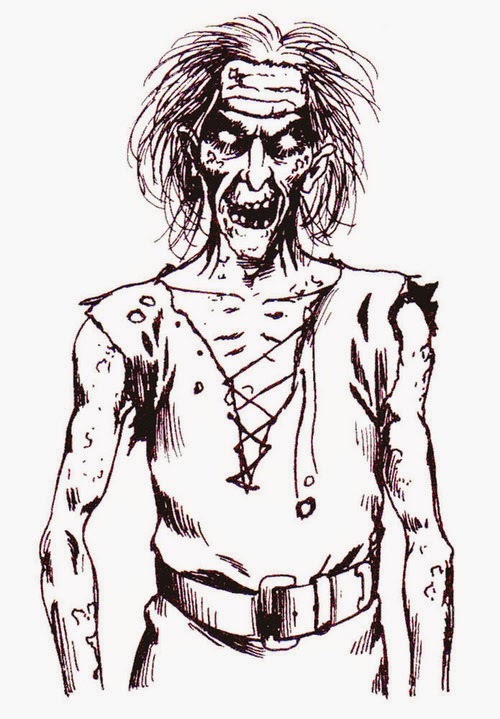 In the Monster Manual II we were introduced to a new zombie type, the Ju-ju zombie. It was stronger, faster and more powerful than the standard walking dead. Ir was the result of a character being killed by a "Drain Energy" spell. I like the idea of Juju Zombies actually being a creation of witchcraft. Maybe it is because I have been rereading the Anita Blake books, but I like the idea of a more powerful zombie being raised by a witch or a necromancer. Above and beyond what a wizard could do. A juju Zombie is created by the 5th Level Witch Spell Animate Dead. Even though it has no true intelligence it can "remember" what it once was and act accordingly. The Juju Zombie has more HD than a regular zombie. On average I like to say 3 or 4. Makes them tough for low level characters. The Ju-ju zombie is a stronger, faster version of the zombie. While zombies are mindless, slow moving corpses, the ju-ju is strong, fast and retains a bit of the intelligence of it's original life. The ju-ju can be created by a witch or necromancer using the Animate Dead spell and the body of a fighter of at least 3rd level. Normal, non-necromancer, wizards can only raise a regular zombie. Like a normal zombie this type can be given instructions, but they can be longer and bit more complicated. On the average they would have an intelligence of about 3-4 (regular zombies would be at 1). The ju-ju zombie is turned as if it were a wight. Whenever I see zombie movies, it always makes me sad, because the I think about who they used to be before. I think it's because the first 'zombie' movie I saw was The Serpent & The Rainbow, which, because it's following an anthropologist, makes at least a nod to what this 'magic' can do to people psychologically. It's like the zombies in movies such as 28 Days then? Yeah. Fast Zombies are what we always have called them. I loved the Serpent and Rainbow. Great movie. Ju-ju zombies sound like bad news to me :). I really enjoyed the Anita Blake books, up until around book 12. My fav character is Nathaniel.